Successful Crowdfunding Campaign at “I believe in you“. With exceeding the funding threshold of EUR 11.111,- within the funding period of approx. 7 weeks the crowdfunding campaign “skiing in a leopard dress” was brought to a successful completion. The whole team would like to thank all 86 (!) investors for their kind support. 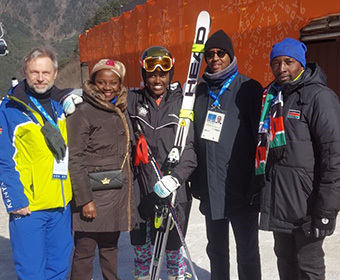 Sabrina Wanjiku Simader has given great pleasure to everyone involved with her 38th rank in Super G - the first result of a woman from Kenya at Winter Olympics. In the future Klaus Tritscher will concentrate again on core tasks of EnTri Consulting – i.e. organizing funding for renewable energy, water and environmental projects as well as market entry activities with focus on Africa and the MENA region.